B2B International recently conducted a survey of 2,000 business decision-makers in SMEs and enterprise businesses across six countries – China, France, Germany, Spain, the UK and the USA. The research, conducted in March, consisted of a sample of respondents with a variety of strategic responsibilities; from business management and marketing to IT, technology, HR, recruitment and procurement. Perhaps unsurprisingly, it found that Brexit is causing a significant downgrade of the 2020 economic outlook for UK businesses. 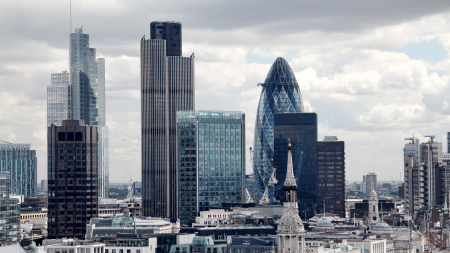 The issue is having a broadly negative impact on UK businesses, with its influence causing 46% of decision makers to downgrade their economic outlook for 2020. This compares to 24% of decision makers in UK businesses upgrading their 2020 economic outlook forecasts, while the remaining 30% say they are not influenced either way. In fact, UK business decision makers were found to have by far the lowest optimism about their 2020 economic outlook amongst the six markets which took part in the survey. 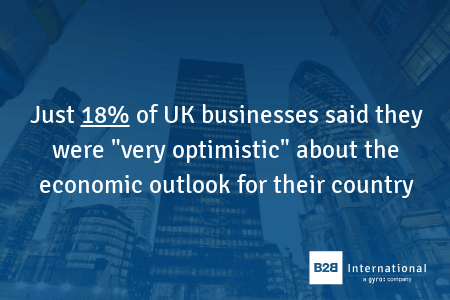 Just 18% of UK businesses said they were “very optimistic” about the outlook for their own country in 2020, compared to 45% in China, 41% in USA, and 38% in Germany. What’s more, this issue has perhaps led British companies to shrink their IT and marketing budgets – which could be damaging in the long term. The research reveals that budgets in areas such as IT and marketing in UK SMEs and enterprise businesses are falling behind, with marketing set to be the hardest hit, with a 2% fall between 2018 and 2019, and 5% between 2019 and 2020 – compared to global rises of 9% and 5% respectively. UK IT and tech budgets are also failing to keep pace, with 6% increases in both years, compared to 10% and 9% globally. The research also showed that attitudes towards Brexit in B2C sectors are more negative than in B2B markets. In total, 24% of European B2B companies view Brexit as an upgrade to their economic fortunes in 2020, while just 9% of those selling to consumers say the same. But Brexit is not only a worry for businesses in the UK. Our research has highlighted concern in other major European markets, too. Just 16% in Germany are optimistic about the economic outlook for the UK, rising to 23% in Spain, and 28% in France. However, business decision makers in China (42%) and USA (40%) are more optimistic about the UK’s fortunes. However, the picture is by no means consistent, with decision makers in France sensing more of an opportunity in the event of the UK leaving the EU, with a sizeable minority in Germany and Spain, in contrast, downgrading their economic forecasts for 2020 due to this issue – 30% in Germany and 37% in Spain, according to our recent research. In France, 24% were found to be upgrading their outlook on the basis of the UK leaving the EU, with a lesser amount, 22%, downgrading their economic forecasts. Fortunately, it’s not all doom and gloom. 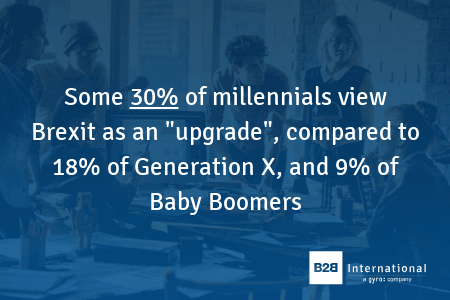 Across all markets, millennial decision makers are significantly more likely than older colleagues to regard the UK leaving the EU as an “upgrade” for their economy. Some 30% of millennials view Brexit as an “upgrade”, compared to 18% of Generation X, and 9% of Baby Boomers. Newer companies are also far more likely to perceive Brexit positively, with 46% of those under two years old upgrading their economic outlook. This falls to 38% of those between two and five years, 31% between five and ten years, 20% between 10 and 20 years, and 11% for companies established for more than 20 years. Optimism amongst younger professionals and businesses is a welcome ray of light during these uncertain times.